U.S. Men's Team Whiffs On World Cup, Sparking Cries Of 'Revenge,' Shock And Rage : The Two-Way "We can't beat Trinidad," commentator Taylor Twellman said, before asking, "What are we doing? ... What are we doing?!?!" Trinidad and Tobago's Alvin Jones (17) celebrates after scoring against the U.S. Tuesday, in a game that served as revenge for his team's 1989 loss to the Americans. The U.S. men are eliminated from the 2018 World Cup. By failing to reach the World Cup for the first time since 1986, the U.S. men's soccer team has set off shock and surprise — and, depending on where you stand, elation or sadness. It's a huge setback for the squad that fell to Trinidad and Tobago Tuesday night; it is also an upset that set off a wide range of strong reactions. "Heartbreak," the U.S. Soccer official Twitter feed said of the loss, which it described as part of a "perfect storm" of results that eliminated the American men's team. The loss immediately touched off criticisms and calls for changes in the U.S. Soccer system. And many compared population sizes — the U.S. has some 326 million people, and Trinidad and Tobago has 1.2 million. And this week, Iceland, with a population of 335,000, became the smallest country ever to qualify for the World Cup. Soccer fans also noted that the women's national team has enjoyed record-setting levels of success — and for less pay: Its members filed an equal-pay lawsuit against U.S. Soccer last year. Others said the collapse was proof that the U.S. player development system is inherently flawed. In a rant that has been widely shared, soccer commentator Taylor Twellman of ESPN was unable to contain his anger, calling the showing "an utter embarrassment" that will give the American players nightmares for the rest of their lives. "We can't beat Trinidad," Twellman said, before asking, "What are we doing? ... What are we doing?!?!" Grant Wahl of Sports Illustrated called it the "most surreal and embarrassing night in US soccer history." Nate Silver says it was "the worst loss ever" for the men's team. "What actually happens and what comes out of this, I think, is anybody's guess. There are some entrenched interests in American soccer. Certainly, Major League Soccer, as the top professional league, has a lot of pull, as do the owners of that league. So, whether or not we see fundamental change, I think, is the question." Davis adds, "You're going to hear a lot of yelling and see a lot of people going in that direction. It just depends on whether somebody can pull those strings together." Some of the calls for change have been directed at U.S. Soccer Federation President Sunil Gulati, who could now face an uphill battle if he decides to run for re-election in February. "It's not good enough," Gulati said after the match, according to MLS Soccer. The league site also quotes Gulati as saying he is confident in the U.S. system and saying, "You don't make wholesale changes based on the ball being 2 inches wide or 2 inches in." Panama — which seized the World Cup slot the U.S. held in its grasp before letting it slip away last night — has declared today a national holiday, celebrating the country's first trip to the tournament. In Panama City, workers were busy cleaning the streets after an impromptu party that lasted until dawn Wednesday, newspaper La Prensa reports. In Trinidad and Tobago, the word is "Revenge!" — that's the headline of the Trinidad Express newspaper's story about the country's Soca Warriors dispatching the U.S. men's team Tuesday night, denying the visiting Americans a World Cup slot for the first time in decades. The newspaper notes that the upset comes nearly "28 years after the United States denied Trinidad and Tobago a World Cup berth with a 1-0 win in Port of Spain, on November 19, 1989." In much of the U.S., that 1989 win might not be revered as the touchstone it would be in more soccer-crazed countries. But it's been cited by FIFA, soccer's international governing body, as a moment that "would end [the U.S.] stint in something of an international purgatory and revitalize the sport." Since that victory, only six countries had enjoyed a better run of World Cup appearances than the U.S. But the sun has set on that streak — and as the sun rose in Trinidad and Tobago on Wednesday, the Trinidad Express notes, the upset was "being savored this morning by all of T&T," in no small part because it denied the U.S. a spot in the final rounds of next year's tournament. Coming into the game, Mexico and Costa Rica had secured their trips to Russia, as the No. 1 and No. 2 teams. The U.S. was able to dictate its own fate — even a draw would have sent it to the cup. But instead, Honduras and Panama beat the top two teams and elevated themselves past the Americans. Trinidad and Tobago beat the U.S. despite having very little to play for, other than pride. The team had lost eight games in the qualifying round and stood last in the six-team CONCACAF field known as the Hexagonal — or simply, "the Hex." The U.S. squad came into this match complaining that conditions at Trinidad and Tobago's Ato Boldon Stadium had been too rough to hold an effective practice; head coach Bruce Arena said of heavy rains, "The field conditions definitely change the way the game is going to look...it'll be slower, a little bit sloppy, but we have to adapt." The Trinidad and Tobago soccer federation issued a statement on Tuesday noting that the U.S. hosted a World Cup qualifier in blizzardlike conditions in Colorado four years ago, facing Costa Rica. The U.S. won that match, 1-0. The first goal against the U.S. came courtesy of an own goal by defender Omar Gonzalez, whose attempt to clear a crossing pass sent a wickedly looping ball toward — and over — U.S. goalie Tim Howard. "It's one of the most unlucky goals ever, I think, for myself," Gonzalez said, according to Goal.com. "It's one that will haunt me forever." After last night's loss, Arena said it was a "blemish" for the U.S. squad. He added, "Give our opponent credit. They played well. They played hard on a day they won a lot of individual battles against us. They deserve all the credit for their win." Arena later added, "We should not be staying home for this World Cup." 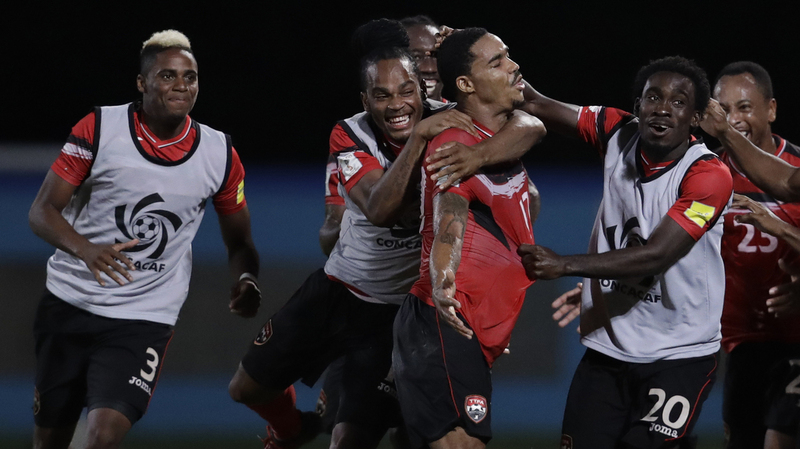 Only a month ago, the Soca Warriors had endured their own mix of mortification and sadness over missing out on the World Cup. In a match that included odd echoes of last night, defender Carlyle Mitchell, who has played in the MLS for the Vancouver Whitecaps, scored an own goal to put Panama ahead, 2-0. "Firstly, I want to apologize to the nation and to coach Dennis Lawrence, his staff and my teammates for the way in way the results went. This has been the biggest disappointment of my career. I feel like I've let my country down, my teammates down and I will not pretend that we did things the way it was [supposed] to be. This is not something you just wake up in the morning and forget all about."